Those interested in St. Casilda might wonder about the identity of the "San Vicente" after whom the waters where Casilda obtained her miraculous healing were named. 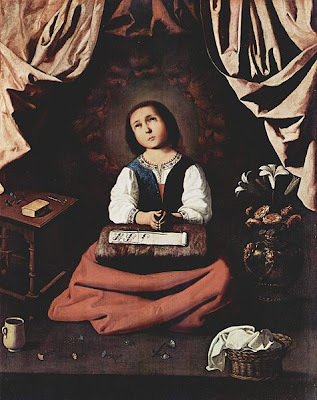 "San Vicente" refers to St. Vincent, the 4th century martyr whose feast day is January 22. Near where St. Casilda was healed, there was once a monastery dedicated to St. Vincent. That is how the waters there came to be named after him. 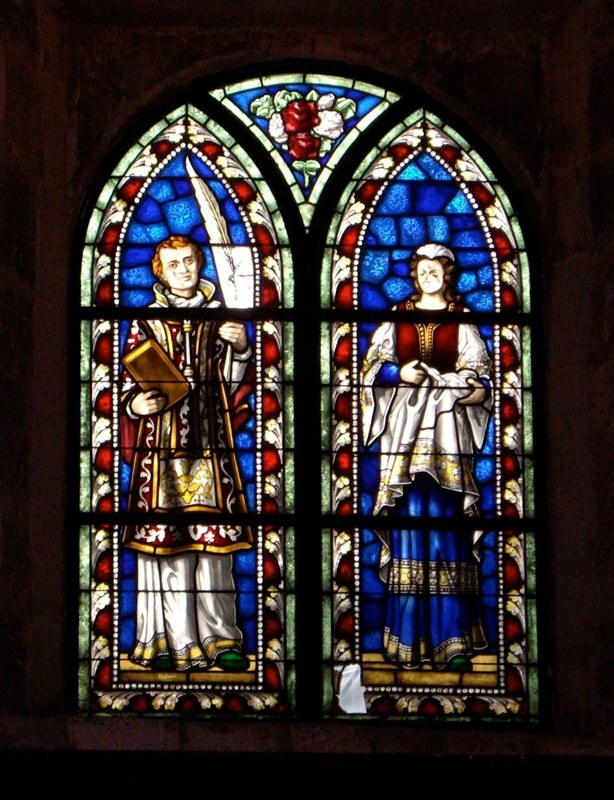 St. Vincent was born at Huesca in Aragon in northeastern Spain. He served as a deacon in Zaragosa, which is also in northeastern Spain on the Ebro River. And, he was martyred under the Roman Emperor Diocletian in the eastern coastal city of Valencia in 304. In the proceedings that resulted in his martyrdom, Vincent was brought to trial along with his bishop, Valerius. It is said that because Valerius had a speech impediment, Vincent spoke for both himself and the bishop. The Roman governor became so angry because Vincent was very outspoken and fearless that he had Vincent tortured and killed, whereas he only exiled the bishop. There is a tradition that after Vincent's martyrdom, ravens protected the saint's body from being devoured by wild animals until his followers could recover it. St. Vincent's remains were then taken to what is now known as Cape St. Vincent. A shrine was erected over his grave and flocks of ravens continued to guard it. In 313, less than 10 years after Vincent's martyrdom, the Emperor Constantine legalized Christianity throughout the Roman Empire. But, by the 5th century the Roman Empire had disintegrated. Next, the Visigoths ruled Spain. Partly through the efforts of Isidore of Seville (560-636) and his brother Leander, around 589, the Visigoth King Reccared and his nobles converted from Arianism to Catholicism. Around 600, the Visigoths began building the Cathedral of Córdoba dedicated to St. Vincent. The people of Visigothic Spain were very devoted to St. Vincent. The Moors conquered Spain in 711. The Arab geographer Al-Idrisi called St. Vincent's shrine "Kanīsah al-Ghurāb" (Church of the Raven) because of the ravens that guarded it. Later during the 700s, the Moors took the Cathedral of Córdoba dedicated to St. Vincent through a forced acquisition and used parts of it to build the Great Mosque of Córdoba, constructed between 784 and 987. The Córdoba mosque was re-taken by the Christians in 1236 and once again became a Cathedral. The re-conquest of Spain was largely completed by 1238 and entirely accomplished in 1492 by the Catholic Kings, King Ferdinand II of Aragon and Queen Isabella I of Castile. Adapted from the Wikipedia article, "Vincent of Saragossa", supplemented by additional sources. 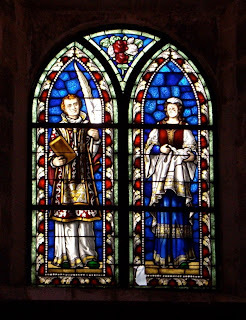 Stained glass window depicting St. Vincent Martyr (left, holding the palm of martyrdom) and St. Casilda. From the shrine of St. Casilda near Briviesca. 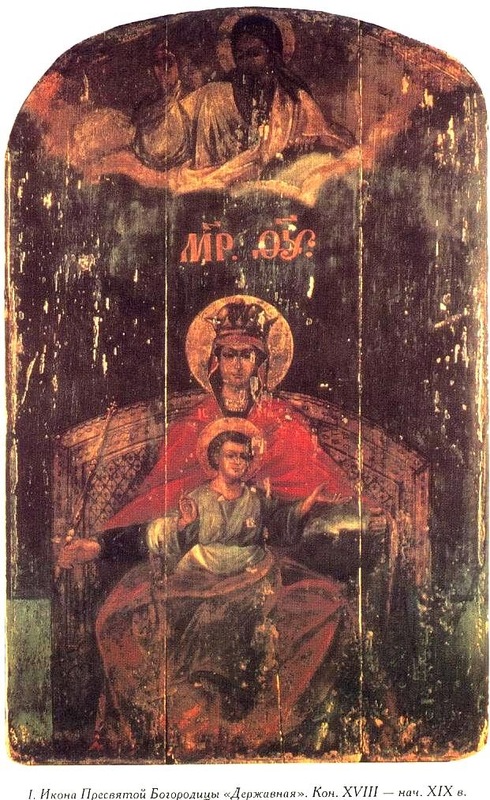 Both saints have always been venerated at the shrine.